This is a year that has made no sense at all. The Rebs are 5-3 while looking like a 1-7 team. There’s one reason and one reason only that Ole Miss is one win away from getting to that six win threshold a bowl-eligible team strives to reach. It’s that the players have earned it. They go out there, week in and week out, and play with heart and a chip on their shoulder. It’s evident that giving up isn’t an option for them. I wish I could say the same for these coaches. I’m referring in part to the leader of the 7th worst defense in the country, Wesley McGriff, who called a game in which an SEC defense gave up 382 yards and two touchdowns to an FCS quarterback. Imagine a world in which you’re down three possessions in a home SEC game with 12:18 left. Your defense has played great for most of the game, and you have a 4th and 13 in opposing territory. I think I can speak for everybody except Phil Longo and Matt Luke in saying that we would all decide to go for it, but Longo and Luke make the decisions, so we didn’t go for it. 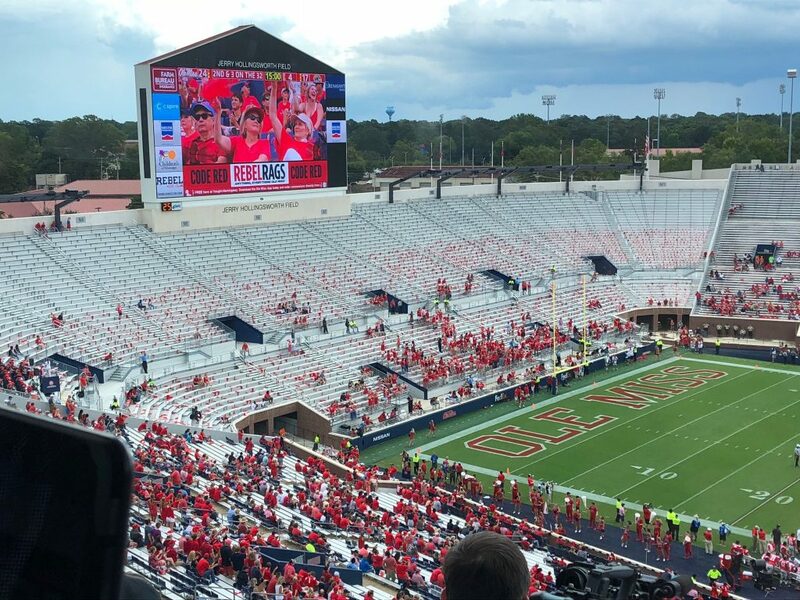 If anybody on the coaching staff, athletic department or administration is really wondering why students would rather sleep in or stay in the Grove during a football game, the refusal to play to win is among many of the reasons. During a normal year, I would be ready to scold everybody who didn’t bother to show up to the football game, leaving the student section with a blinding bareness. But let’s be real, this isn’t a normal year. To start with the obvious, when closing in the stadium two years ago, the administration decided it to be wise to move the students from the south end zone to the north, the absolute last spot in Vaught-Hemingway that the grueling Mississippi sun decides to hide its face. Second, students are struggling to find an incentive to come and actually stay at the football games. Free refills and donuts, 4th quarter dollar hot dogs and singing the alma mater with the team after the game just aren’t enough for students. As much fun as it is telling opposing teams, “We’re gonna beat the hell out of you,” being pretty sure that we aren’t and locking the Vaught are the only times we actually do something uniformly. Arguably one of the best student sections in the country, LSU, has a uniform and hands-on action, often in coordination with the band, for every halfway big play. It seems that LSU understands that college kids have short attention spans. That’s why, even during a good game with good conditions, a large number of students are turned around talking to their friends, sitting down on their phones, or getting bored and walking out at halftime in a 4-point game as I observed many students doing on Saturday. For this cemetery to show life again, the administration and the athletics department need to seriously consider what the students have to say. If you want students to fill their designated area, provide incentive for them to do so. Take action to move us back to the south end zone. Instead of having the mascot do the “first fins up” that adds insult to injury in an already-train-wreck of a mascot situation, coordinate with the band and with students to give us something to do to keep us in the game. Finally, hire coaches that know how to win and are willing to take risks to win in the SEC. Students are extremely important to the fan base of a college football team, and while I encourage everyone to continue going to the games and supporting the players that are still leaving everything on the field every week, I can’t blame them for deciding something else is more worthy of their time. Chancellor Vitter and Mr. Bjork, it’s time for you to take action and give students a reason to drag themselves out of bed and from the Grove to fill Vaught-Hemingway. It’s important for something to be done because the last thing this program needs right now is for the students to give up.